Now all we need to do is build up a top-5 offence around him and recoup 2 of those 3 picks and we're golden. Twitterquoted in a DGB post? Consider me honoured. I think next year we'll have a great first line with Kessel on the right side, Kadri in the middle and Taylor Hall on the lef... erm... oh right. Darn. I'd like Kessel to play with Grabs moving forward. He's certainly got more skill than Stajan. Hopefully Kadri and Kessel can combine make some beautiful music. We were giving Kessel Team Play ratings in the PPP GT thread. I think the consensus was B and the coaching adjustment was "Don't let them take the body on you." kessel sure did look impressive, conversely matt stajan looked like a fourteen year old boy on his line.. Blake didn't look to bad though and spent a season high 33% of his time on the ice on his feet..
Kessel, with Kaberle, Gustavsson, and next year, Kadri, plus whatever else Burke can pull out of his hat, looks pretty good to me. I don't see too many teams with 2 elite forwards, an elite goaltender, and an elite veteran defenceman, but the Leafs are getting close. I think the Leafs should load up on players whose last name starts with the letter "K". 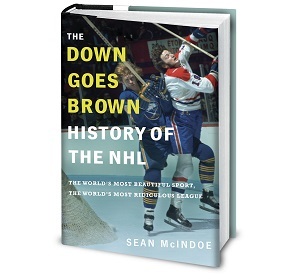 Joe Bowen would have a konniption. The contrast between Blake and Kessel is pretty striking. They both play almost the exact same style, but they're totally different players. Blake seems to try the same outside move every time, Kessel is all over the place. Blake's predictable shots float harmlessly into the goalie's chest, Kessel gets them off from anywhere and picks corners. Basically, Phil Kessel actually is the player that Jason Blake incorrectly thinks he is. This is funny however you're right....over all it's just sad. Kessel Vessel... that's gold. I'm stealing it. They need to bring Stalberg back up so the team has another burner to throw out there. Grabo and Stalberg on one line is awesome speed and Kessel/Blake would also give d-men fits. Call up Bozak to centre Kessel eventually. He's a gifted playmaker. Are you serious? Did you say two elite forwards? Kessel and who? Someone who's played a handfull of games in the nhl, no to mention during preseason(Kadri)... (not saying Kadri's no good, but you can't classify him as a elite forward yet). 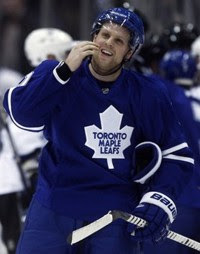 As for Kessel, I agree he's good. Not yet in the elite category, but really good. Btw he will not be considered elite unless he plays with an elite passer (ie: Marc Savard, the most underrated center in the league). Last year, Savard assisted on 60% of kessel's goals. Who do the leafs have to set this guy up? Grabovski; who couldn't even crack the lineup of the Mtl Canadiens? Did you also say an elite goaltender? Who Toskala (I know, I'm being sarcastic)? But really are you putting a 24 year old goalie who was never drafted, has one 1 win out of 6 games played in (in his defense, he only started 5) has a .901 save percentage and a 3 gaa (2.98 to be fair) as an elite goaltender?! I won't refute you point about Kaberle being an elite defender. So 1 out of the three things you said are somewhat accurate. Now that I've had my fun destroying your post, please stop being unrealistic about the expectations of this terribly built Burke team, who has managed to destroy the rebuilding process with one trade, which will haunt the LAffs for years to come. Speaking of which, how will the Bruins look with Taylor Hall in their lineup instead of yours? Enjoy watching this dreadful team for the rest of the year. Bozak is the perfect fit for the Blake Kessel line. I think everyone is being a bit hard on Blake. Although he does stay to the outside quite a bit, he does break in when he has the opportunity. Bozak has the speed to keep up with Kessel and Blake and can make those passes that will quickly get his linemates to start producing in the goal column rather than the shots column. I have to admit that Simon made some very accurate criticism of our Leafers. Kadri and Gustavsson are years away from being classified as "elite" players. Kessel is a fabulous offensive force for our team and will continue to get better over the next couple years but also isn't 'elite' yet. It is way too early to make those kinds of criticism of Burke - yes the Leafs have an abysmal record but they are 4 points away from moving up 5 spots in the standings. I am in no way saying that this will happen but the Leafs are only 7 points away from the last playoff spot with 69 games left. This isn't me saying "we still have a chance to make the playoffs" but it is me saying that Taylor Hall is absolutely not going to Boston next year. Bozak has the potential to be a great centerman. Definitely not a Savard, but the player that Kessel needs if he wants a couple assists. Grabovski should absolutely NOT be on the first line. He's too weak, he plays with the puck and loses it quickly, and can't play positional hockey. Grabo should be put at third line center while Stajan is put at second. Grabo should also be on the first power play where he has more room to move. Seriously Simon, why do you waste your time? Kadri - drafted 7th overall in the first round. "Elite forward" is an optimistic projection based on his draft position, his pre-season display, his OHL numbers last season(78 points/56 games 21 points/14 playoff games), and his attitude and composure. Yes it's optimistic but it's not unreasonable. There's a reason why he was drafted in the first round and why other teams like Ottawa and Boston were interested in him. Compared to anything else the Leafs have had up front recently, aside from Sundin, Kessel is an elite forward. It's all relative, okay? He's OUR elite forward. Gustavvson's stats are getting better every game he plays, have you noticed that? Come back at the end of the season and tell me what they are. Better yet, wait another year. For what it's worth: last year in Sweden: 42 games, 1.96 GA, .932 SV%. 13 playoff games, 1.03 GA, .961 SV%. I know it's not the NHL, but as Burke says, at any proffesional level, those numbers make you blink 'cause they're unfathomably good. Grabovski; who couldn't even crack the lineup of the Mtl Canadiens? What a joke. I won't even honour that with a response. Instead, what I want you to do is visualize Grabovski, wearing a white jersey, hands held over his head in a double peace sign salute just for you. And finally, a side-swipe at Bone: Please don't honour trolls who use expressions like "LAffs" by saying their criticisms were accurate. ...terribly built Burke team, who has managed to destroy the rebuilding process... Simon had absolutely nothing intelligent to say. I never suggested all of those players were elite yet. I said "I don't see too many teams with 2 elite forwards, an elite goaltender, and an elite veteran defenceman, but the Leafs are getting close." Really weird to have to repeat yourself when it's right there in black and white. What they desperately need is a first line center (kinda obvious, I guess). They have a couple of players who can play more or less decently on the wing with Kessel. Grabovski's a nice 2nd line center while Stajan's a 3rd, no more. Kessel could have had at least 2 gaols, but Nittymaki stole the show. Sugh, DGB is correct. Many a commentator said, including Wilson and Burke that the Leafs really didnt have any top 6 forwards. Kessel shows they were right. But that can and will change. Its risky, so far Burkes eye for talent...Gustavsson,Beachamin and Kessel (still waiting on Komi) seem to be playing out. The question is will it play out with at least one of the three college kids (stalberg, hanson and Bozak) and Kadri should make the jump. The difference between really good, ok and oh no is if whether all 2 , 1 or none of those college guys makes the leap and proves they belong on the second or first line sometime this year. A lot going on in that little phrase! Pretty simple reason. As opposed to some people presumably sitting on there asses complaining and/or making outrageous claims about teams, I'm sitting at work and kinda bored. Btw, I agree that the prediction of Kadri isn't unreasonable. I never made that claim. However, it will take more than one year in the AHL for him to reach that level. I also agree that he was highly coveted (if you need help with words such as coveted, here's a link to the oxford online dictionary http://www.askoxford.com/concise_oed/covet?view=uk). And you say you wont respond to my Grabovski crack, then you respond with and imaginary scenario? That's odd and very productive. I'm glad you didn't waste your time. of other teams winning the cup? . Finally, how did you know I was a troll. Your 100% right. I'm about 4inches tall (as tall as some of your body parts I assume), have bright green hair and live in a tree! Finally I can come out and admit that! What a relief. Thanks for giving me something to do during slow work days. You know what would immediately improve this team? Bringing pack the horizontal striping at the waist of the jersey. That has to be worth at least 15 points. haah, Simon and the General are making friends! Kessel does'nt necessarily need "an elite" center to score. he needs to develop a chemistry with someone who can get him the puck. it could be another winger, a Dman, just someone to get him the puck. Stajan isn't a superstar, but hes an above average passer. give them 10-20 games and see if something develops. Pass 1st C's are a dime a dozen in the show, so we can get one. oh and a point about blake... he had 63 points last yr making 4.5 mil. It was stunning how much better then everyone else Kessel watch. I'm in Europe for the year, and I stayed up late watching the game online and it was quite nice to watch Kessel command respect every time he was on the ice, cept from Ohlund, who forgot to check his emails, but hey! at least his shoulder was ok! I believe in Jesus Kessel/Phillip Christ! ps. Chris Durno is up with the Avalanche! WOOT! Sadly your column is as accurate today as it was then.